As Director of Sustainability for JL Architects, I am active as both a Green Globes Professional and Green Globes Assessor for the Green Building Initiative (GBI). Green Globes is a well-established green building guidance and assessment program that offers a practical and affordable way to advance the environmental performance and sustainability of a wide variety of building types. I recently had the pleasure of completing the Green Globes for Sustainable Interiors (Green Globes SI) Stage II Verification for the United States Department of Veterans Affairs Strategic Acquisition Center in Fredericksburg, Virginia, and proudly share that the project successfully achieved 3 Green Globes! Green Globes SI was designed to be a rating system specifically for tenant improvement projects, fit-outs, and remodels. The Government Services Administration (GSA) recommended in October 2013 that agencies use a high-performance building certification system that best suit the agency missions and portfolio needs: Green Globes SI was an excellent fit for this project. The project is a tenant improvement of existing office space located in suite 400 of a four-story building and occupying 19,950 square feet. During the on-site assessment, I completed the following: a tour and physical review of the completed renovated space, interviews with members of the design and construction team who were responsible for the management of the project, and a review of product submittals and documentation. This allowed for me as the Green Globes Assessor to verify the targeted achievement defined by the project team, and as confirmed in the Construction Documents. Discussions focused on substantiating the points from the online self-evaluation using the construction documents, records of the design and construction processes, specification sheets, shop drawings, logs, meeting minutes, reports, computational models, and other relevant information. At 8:30, the facility was toured to verify installation and implementation of the features. Following the tour, a closure meeting was conducted to review the tentative results of the assessment and identify additional information required to complete the Stage II verification process. Meeting minutes were provided to reflect initial and final performance goals. Qualitative values and metrics were provided in the Construction Documents to demonstrate green design, as well as performance goals for energy, water and indoor air quality. Programming the BAS is one way to capture energy use patterns. Such data can be tabulated, charted or further developed to review trends and anomalies. Regularly-reported data is the key to determining possible causes of problems, such as control drift, set point overrides, scheduling errors, and other operational issues. With this information, corrective action can be taken to modify operational parameters (such as set points, ventilation requirements, HVAC resets, schedules or behavior changes to bring energy use back to acceptable ranges. 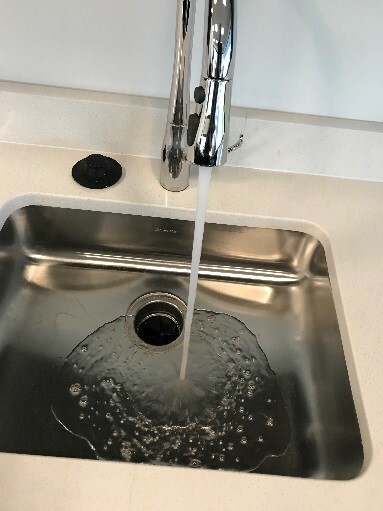 The kitchen faucet in the break room conforms to WaterSense even if the program currently does not have criteria for kitchen faucets. The faucet, with the addition of an aerator installed, does comply with the WaterSense Bathroom Faucet criteria of 1.5 GPM and therefore equivalent points were credited. The residential dishwasher complies with the ENERGY STAR label and maximum water use per cycle. Many of the furnishings provided are convertible to serve multiple functions for instance, large conference tables can be separated into smaller meeting tables, file cabinets and also serve as seats, and break room island can be used as work area, eating counter or buffet. 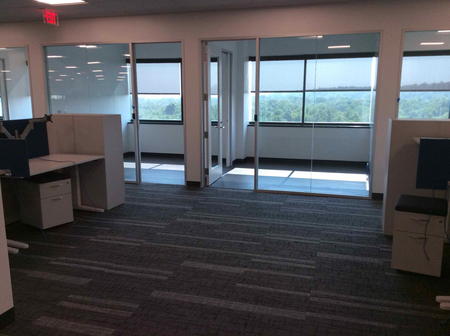 Pocket partitions are installed in perimeter offices to provide private office, work rooms, or shared spaces. All offices and work rooms have one wall with an applied surface that can be used as a white board surface. The Building Owner’s pest management policy was documented and reviewed. 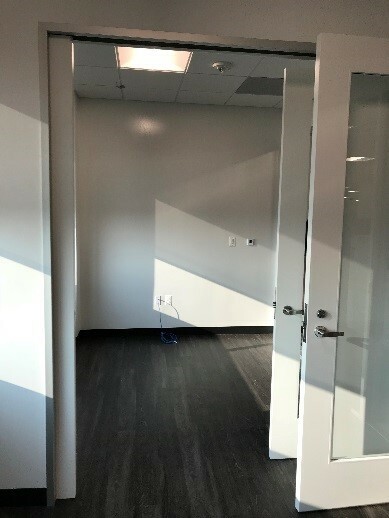 Janitorial supplies and equipment are stored in an existing janitor closet close to the project’s location is ventilated and has full height walls. Primary occupied spaces have prescribed lighting levels for different types of anticipated tasks recommended per IESNA standards. 3:1 between the task and adjacent surroundings. 10:1 between the task and remote (non-adjacent) surfaces, 20:1 between the brightest and darkest surface in the field of view and 8:1 between rows of luminaires where there is indirect lighting and where ceiling luminance exceeds 124.1 fL. Enclosed perimeter offices have full height + width glazing interior walls and doors to allow daylight into the inner spaces and workstation wall panels are low to allow daylight to penetrate throughout the open office. Verification resulted in a final score of 607 out of 786 applicable points, which equates to 77.2% and a Three Green Globe rating for the US VA Strategic Acquisition Center in Fredericksburg, Virginia. This level of sustainability is a notable accomplishment! Ready to talk about your next Green Building Certification? Want to know more about the common-sense approach to achieving a green building certification? We have prepared a registered AIA presentation to introduce you to JLA and the Green Globes building certification process. I have completed green building certifications for universities, K-12, healthcare, transportation, distribution centers, offices, multi-family properties, retail, and restaurants. What is a Green Globes Assessment?